The mountains and rugged terrain between West Vancouver and Squamish provide some incredible hiking experiences which offer scenic views of Howe Sound from up high. Some of these trails are the more challenging trails in the region but the reward of incredible views on clear sunny days is more often worth the effort. How many of these viewpoints have you seen? The viewpoint at St. Mark’s Summit overlooking Howe Sound. 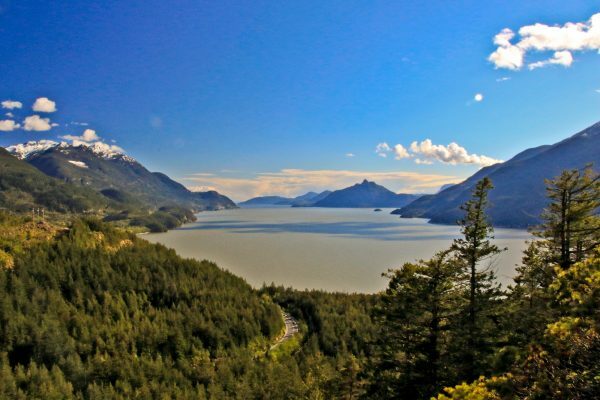 Starting from the Cypress Provincial Park downhill ski area, follow the Howe Sound Crest Trail to St. Mark’s Summit where you will be treated to a view of Howe Sound looking out towards Bowen Island. Along the way, make a quick detour to the Bowen Lookout for an alternate view of the area. Part of the route to St. Mark’s Summit, the Howe Sound Crest carries on, passing over Unnecessary Mountain before reaching the Lions. The route continues and eventually ends at Porteau covering a distance of 29km through very difficult terrain. While this entire route is NOT doable in a day, extending your hike to Unncessary Mountain is but keep in mind that you should pack plenty of water during the summer heat as the route is fairly exposed and there are no water sources. Mount Gardner is located on Bowen Island, a short ferry ride from the mainland, and offers scenic views of Howe Sound looking towards West Vancouver. Plan to make a day out of this adventure as you will need to take the ferry from Horseshoe Bay, then walk to Kilarney Lake, before heading up to the peak. A view across Howe Sound just above the Sea To Sky Highway along the Lions Bay Loop. One of the few “easy” hikes in the region, the Lions Bay Loop follows a network of trails and passes several viewpoints that are located just above the Sea To Sky Highway. As an added bonus, the trail also passes the scenic Crystal Falls before heading uphill to another viewpoint and looping back to the start. The view of Howe Sound looking down to Lions Bay from the Lions Binkert Trail. The Lions are Vancouver’s most recognizable peaks and the view of Howe Sound is stunning as you make your way to the top. 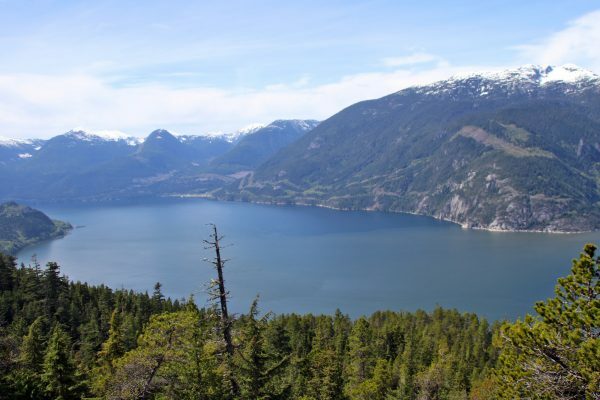 The best views are along the Lions Binkert Trail as you clear the treelike and make your way up the rocky slope to a wide open view looking down at Howe Sound. Starting near the highway, the climb to Brunswick Mountain gains more than 1500 meters! The views are unparalleled as you stand atop one of the highest peaks in the region looking out over Howe Sound, Bowen Island, and all the other peaks in the area. View of Howe Sound from Tunnel Bluffs. Not as high as some of the other hikes in the region, the trail to Tunnel Bluffs starts out steep before gradually climbing for the second half of the hike. The view is incredible on a sunny day as you peer out at Howe Sound and see the passing cars far below. The Quercus Viewpoint in Murrin Provincial Park. That popular lake full of families during the summer on the way to Squamish also has an incredible viewpoint that looks out over Howe Sound called the Quercus Viewpoint. The Murrin Loop Trail is short but it’s very steep as you climb up wooden stairs before the trail reaches the final rocky viewpoint with a wooden bench above Browning Lake. The viewpoint of Howe Sound just beyond Petgill Lake. While there are no views at Petgill Lake, if you continue following the trail beyond the lake a short distance, you will be rewarded with an incredible view of Howe Sound. It’s this viewpoint that makes the hike worthwhile. Squamish’s most iconic mountain, The Chief has three peaks and all of them offer their own great views of the region. Be prepared for a steep hike and to share the trail with plenty of other hikers on a busy weekend. The viewpoint halfway up the Sea To Summit Trail near the Squamish Gondola. The Sea To Summit Trail is the Squamish Gondola’s answer to the Grouse Grind. Formerly known as the Upper Shannon Falls Trail, the route has an incredible view looking out into Howe Sound at about the halfway point. Of course, there are also some great views from the top and as you take the Gondola back down. 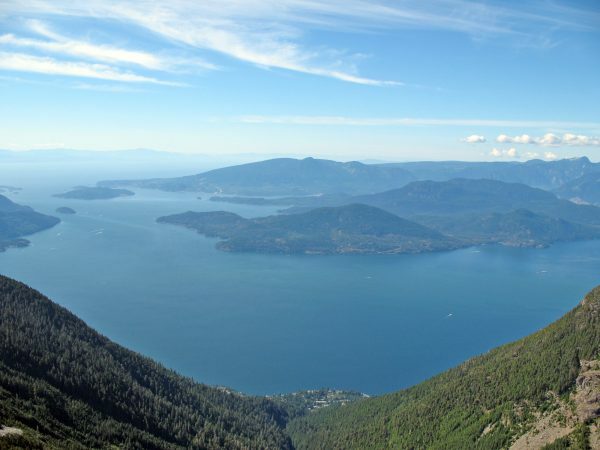 The Al’s Habrick Ridge Trail starts from the top of the Sea To Sky Gondola and it climbs quickly to reveal many scenic views of Howe Sound as you follow the ridge. One of the best views is when you reach the rocky bluff where the large boulder sits as you have an unobstructed view of the region. Viewpoint looking across Squamish towards Howe Sound from Smoke Bluffs Park. An area that’s popular with climbers, Smoke Bluffs Park has a few viewpoints that offer views looking out into Howe Sound. These trails are used by climbers to access the different climbing sections of the park and the loop trail is not too difficult in comparison to some of the other hikes along the Sea To Sky. 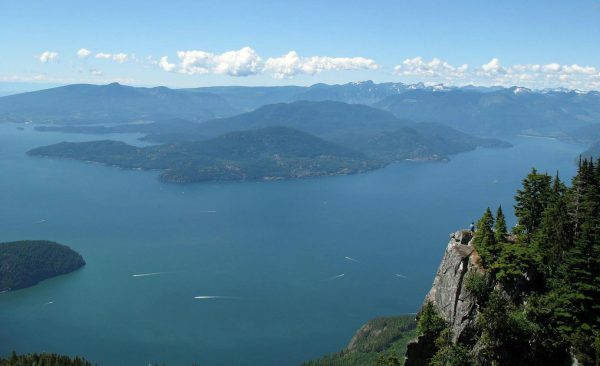 Have you enjoyed the view of Howe Sound from another mountain viewpoint? Share your experience with us!